Designated as a UNESCO World Heritage site in 2008, Melaka is a historical destination with a colonial past encapsulated in more than 400 years of Portuguese, Dutch, and British influences. Today, its rich heritage is most evident in the carefully preserved buildings around the old trading port. If you want to learn more about Melaka’s rich history, these cultural gems are great places to explore. The Maritime Museum is a replica of ‘Flor de la Mar,’ a Portuguese ship that sank off the coast of Melaka on its way to Portugal. Located near the estuary of the Melaka River, the museum houses exhibits, artifacts, and documents from Melaka’s golden era as the Emporium of the East and highlights the city’s importance as a regional and international business hub from the time of the Melaka Sultanate in the 15th century right through the various colonial periods. Look out for: A collection of different ship models that are on display at the museum. With a name that translates to ‘The Famous’ in Portuguese, the prominent landmark is one of the oldest surviving remnants of European architecture in Asia. Built by the Portuguese Admiral Alfonso de Albuquerque during the Portuguese invasion of 1511, the fortress was meant for consolidating the Portuguese army’s victory after they defeated the troops of the Melaka Sultanate. The fort changed hands in 1641 when the Dutch successfully drove the Portuguese out of Melaka. For the next 184 years, the Dutch utilised the fort and fortified it to improve its functionality. However, when the British took over, they decided to demolish the fort, in part due to the hefty maintenance required. Sir Stamford Raffles, then British Governor, managed to save it from complete destruction. What remains today is a small gate house of the fort. Nevertheless, it stands proud and tall on St. Paul’s Hill. Look out for: A small inscription which says ‘ANNO 1670’ on the fort’s arch as well as the coat of arms of the Dutch East India Company (VOC). One of the most recognisable landmarks in Melaka City, Christ Church was built during the Dutch occupation in 1641. Its huge white cross towers along Jalan Gereja fronting the Dutch Square. Inside the brick-red cathedral are handmade wooden pews said to be centuries old. Plaques of Dutch soldiers and timber crucifixes adorn the walls of the church. Outside, decorative plants and colourful trishaws line up to invite tourists for a ride. Entrance to Christ Church is free. Look out for: Christ Church is a hallmark of 18th-century Dutch architecture with a perfect 2:1 proportion. It has a 27-metre length on its far end and 13-metre length on the short end. 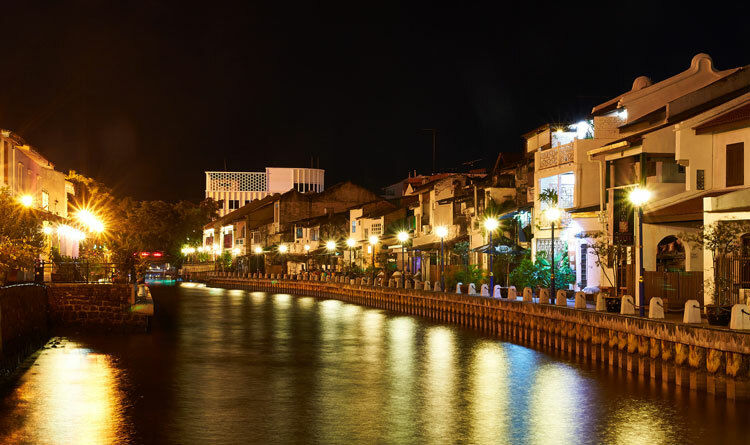 Once called the ‘Venice of the East’ by visitors and occupants from the west, Melaka River has become Melaka’s main attraction with its river cruises. Back in time, its main purpose was a trading post that served the inner lands. Many a merchant ships of small and large sizes docked on its waters. Today, visitors can join a relaxing cruise from Kampung Morten or near the replica of Flora de la Mar. The trip will then pass through Melaka town until it reaches the area along the riverbanks. The river’s full length is around ten kilometres. Look out for: The cruises offered along Melaka River takes about 45 minutes long and most vessels can accommodate up to 40 passengers. Sitting at the foot of St. Paul’s Hill, Melaka Sultanate Palace is a structural replica of Sultan Mansur Shah’s palace. According to accounts, a lighting struck the original building and caused its destruction. 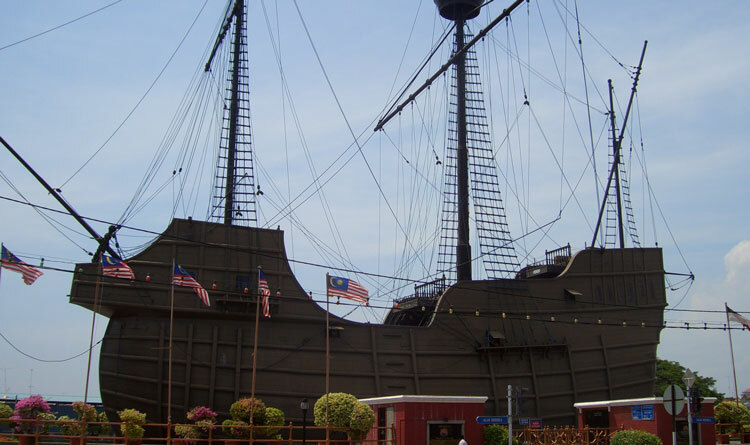 Malaysian craftsmanship was in showcase during the construction of the seven-tier replica. Not a single nail was used to put up the palace and many regarded it as an architectural feat during its time. Inside the palace are eight exhibition rooms. Traditional Malay weapons, jewellery, and costumes, mostly from the Sultans of Melaka are on display. Look out for: The museum schedule, which is Tuesdays to Sundays from 9AM to 6PM. An entrance fee for adult and children is also required.